For the band, see The Joneses (band). 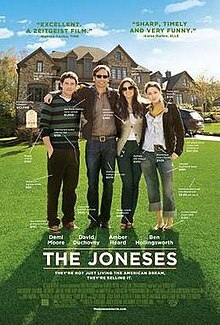 The Joneses is a 2009 American film written and directed by Derrick Borte. It stars Demi Moore, David Duchovny, Amber Heard, and Ben Hollingsworth. It premiered at the 2009 Toronto International Film Festival on September 13, 2009. Roadside Attractions later purchased the United States theatrical distribution rights. It had a limited release on April 16, 2010 and was released on DVD & Blu-ray On August 10, 2010. It received a theatrical release in Mexico on August 20, 2010. Kate, Steve, Mick, and Jenn Jones move into an upscale suburb under the pretense of being a typical family relocating because of the changing nature of Kate's and Steve's careers. In reality, Kate is the leader of a team of stealth marketers, professional salespeople who disguise product placement as a daily routine. Their clothing, accessories, furniture, and even food are carefully planned and stocked by various companies to create visibility in a desirable consumer market. While Kate's team is highly effective, Steve is new to the team, Jenn is a closet nymphomaniac with a penchant for hitting on her fake fathers, and a 30-day review is fast approaching. The team quickly ingratiates itself into the community, slowly shifting from displaying products to recommending them. Soon, local stores and businesses are stocking products based on the Joneses' trend-setting styles. However, at the end of the 30-day review, Steve discovers that he has the lowest sales numbers of the team, and Kate's job is endangered unless he can get his numbers up before the next review in 60 days. Eventually, Steve begins to find a sales tactic that works by playing on the fears of his neighbors and sympathizing with their dull, repetitive, unfulfilled careers. As someone who is frustrated with his job and disconnected from his fake "family," Steve turned to their products to keep himself entertained. When he recognizes this same pattern in his neighbors, his sales begin to steadily increase as he starts pitching products as the solution for suburban boredom and generating product "buzz" through unwitting ropers. The team's dynamics become more complicated when Kate applies herself to the technique as well. Realizing that they can boost sales by perfecting their fake family dynamic to sell the image of a lifestyle, the lines between acting and reality start to break down. Things also get more complicated when Mick finds himself growing closer to an unpopular girl at the high school, Naomi (Christine Evangelista), in whom he can confide, while Jenn's flirtation with Alex Bayner (Robert Pralgo) (one of the men in the neighborhood) raises the suspicions of the neighbors. The team's cover is almost blown at several times: once when an old acquaintance of Steve's recognizes him at a restaurant, again when Jenn's indiscretions nearly expose her real age, and after a party where Mick markets alcohol to minors. Eventually, each member of the team finds that the constant pretense slowly erodes their individual desires. Jenn's dreams of running away with a rich, older man come to a close when she realizes that she was being used by Alex. Mick has a crisis of conscience when Naomi gets into a car accident after drinking too much of a wine cooler that the family was marketing to teens. Worse, when he makes a pass at Naomi's brother, he punches Mick in rage. After creating nearly record-breaking numbers, Steve is offered the chance to join an "icon" unit alone. He refuses, knowing that this is Kate's dream and because he believes that the "family" can do it together. When Steve's closest friend in the community, Larry (Gary Cole), reveals that he's going to lose his house because he's overextended his credit, Steve tries again to see if Kate wants something more than a pretend marriage. She rebuffs him, and the next day Steve discovers to his horror that Larry has committed suicide over the debts. Grief-stricken, Steve confesses to the community about the real nature of his job. With their covers blown, the rest of the Joneses leave quickly and are reassigned to a new home. Steve refuses the offer to join an icon cell and tracks the family down to their new location. There, he reunites with Kate and tries one last time to convince her to leave. Though hesitant she follows him out of town and agrees to meet his family in Arizona. The film has received mixed to positive reviews. Review aggregate Rotten Tomatoes reports that 61% of critics gave the film a positive review based on 103 reviews, with an average score of 6.2/10. ^ "The Joneses (2010)". Box Office Mojo. 2010-07-15. Retrieved 2012-02-14. ^ a b Borys, Kit (September 19, 2008). "Trio joins 'Joneses'; David Duchovny, Demi Moore, Amber Heard in cast". The Hollywood Reporter. Nielsen Business Media. Archived from the original on February 13, 2010. Retrieved February 26, 2010. ^ "TIFF - Toronto Internationals Film Festival - Joneses". 2009 TIFF. September 13, 2009. Archived from the original on February 27, 2010. Retrieved February 26, 2010. ^ Swart, Sharon (November 4, 2009). "Roadside Attractions acquires 'Joneses'". Variety. Reed Business Information. Retrieved February 26, 2010. ^ "The Joneses - Release Date". ComingSoon.net. CraveOnline. Retrieved February 26, 2010. ^ "The Joneses (2009)". Amazon.com. ^ "The Joneses Film Reviews". Rotten Tomatoes. Retrieved 2011-05-10. This page was last edited on 2 August 2018, at 17:22 (UTC).